UPDATE: NOW WITH MORE CHARACTERS!!!! It definitely took some time to finish this piece, but it was worth it. Not only do I get to show a nice summary of all our hard work but I got fantastic reference point for future strips. If you’ve got a comic with any number of characters I’d recommend doing this. Regardless it was nice to reflect and redraw some characters I haven’t done in a long time. We’ve got our regularly scheduled comics for you next week, but the following week we’ve got some big things to share with you. Big things. A continuation of our 200 comic celebration. I think it came out great :). We’ll have a legend with all the character names at some point, and later updates will have that information in the About pages. And hey, if there’s anyone on there you don’t recognize, maybe it’s time for an archive dive, eh :)? In the upper right corner….Jesus is looking down upon them and thinking…you’re all fucked up! I should just delete you all!! I was missing Couchy, glad to hear he’ll be in on the next one. Looks great man, nicely done! Looks like the party’s already started! 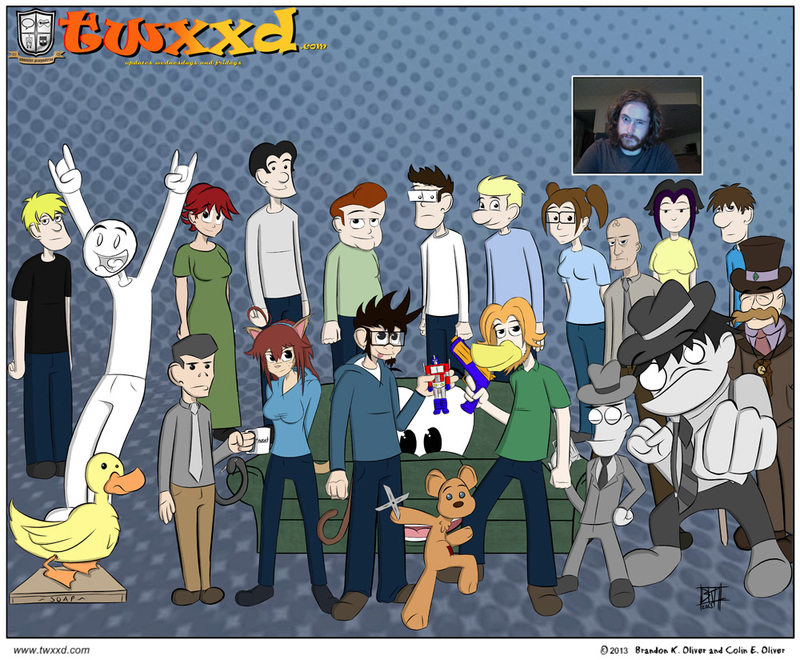 It’s amazing how many personalities you have appearing in your strips, it’s fun to see them all together! Super congrats on reaching your 200th, O Bros! I like the big scary eyeless noir looking dude. Love the pic of Colin.